On this day in 1956, tens of thousands of Hungarians in central Budapest took to the streets (in what started as a peaceful rally) to demand the end of Soviet rule. Emboldened by the recent success of the Poles in returning their Soviet-ousted liberal Prime Minster to power (more popularly referred to as Polish October), the Hungarians were demanding Imre Nagy, former Prime Minster, to be reinstated (he was removed for his liberal policies and sent to be “rehabilitated”). They were also demanding free elections and freedom of the press. Through hours upon hours the demonstrators remained resolute in their protests, even when the Soviet troops started to open fire. Two days later, Soviet tanks started shooting, killing hundreds of demonstrators. But undeterred, the protesters stayed and succeeded in overthrowing the Soviets (for ten days). Imre Nagy was briefly reinstated and pledged to free the country from the strongholds of communism. But on November 10th, Nikita Khrushchev sent the soviet army to quell the rebellion. Thousands died and over 200,000 people fled Hungary. Two years later, Soviet agents abducted Imre Nagy from the Yugoslavian embassy where he was taking refuge, tried in secret for treason, and then executed. This is the stalwart, though violent truth about revolutions. When the powers stop paying attention to the will of the people, the people rise up. Risk their own lives to save their own lives and the lives of their family. I have spoken many times in my life about how I am proud to be Scottish, proud of their long, determined history of rebellion against English rule and their own demand for independence. And in this exact way, I am very proud to be Hungarian as well. It is all too much a silent part of many Americans, children of children of immigrants, of people who risked everything to survive in their own country and then perhaps then to make their way to America. And maybe the fighting spirit in a lot of Americans, the kind that stems right from the bloodlines, has just gotten distilled over time. But on days like this, I am humbled, and reminded that change–real change–comes from the sacrifice of the people. I’ve written more about the Hungarian revolution here. Everyone has the day off today, and many of the streets near Parliament are closed (even to pedestrian traffic). Like in America, there is an extremely unpopular Prime Minster currently in power here (Ferenc Gyurcsány of the Hungarian Socialist Party), and there are many schedule demonstrations planned by anti-government protesters. I probably won’t venture out to get pictures because there is pretty real danger of violence (as was the case two years ago, and honestly I would like to enjoy a leisurely weekend free of tear-gas), but I’ll try to write an update on how things go. And hopefully the day will remain mostly a commemoration of the people in 1956, whose oblation played a crucial role in the eventual collapse of Soviet communism. 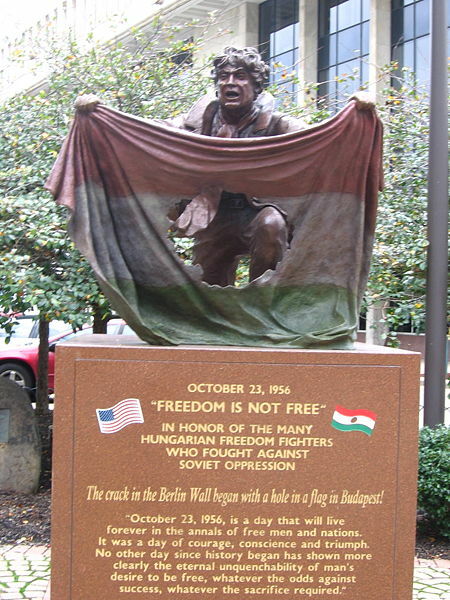 Or according to the statue in Mindszenty Plaza in Cleveland no other day has shown, the eternal unquenchability of man’s desire to be free, whatever the odds against success, whatever the sacrafice required. Nice post Jess. You should go to Prague for a few days and investigate the Prague Spring of 1968. It is my favorite of student led, anti-soviet movements, from the eastern block. Find me some primary sources so that I can use them for a thesis in a few years! That’s why you have to come and visit me– to gather your own primary sources. Actually, I know you would love this part of the world. It really would suit you. But until you arrive, I’ll do some initial digging for you. ! !